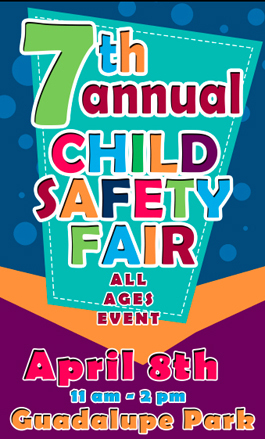 Local parents will have access to information designed to help keep their children safe and secure, as well as a day of food and fun, as the Artesia Police Department hosts its Seventh Annual Child Safety Fair Saturday at Guadalupe Park. The event is scheduled to run from 11 a.m. – 2 p.m. at the park, 401 W. Logan Ave. This year’s event is sponsored by several agencies and businesses, including the APD, Artesia Fire Department, Eddy County Sheriff’s Office, New Mexico State Police, Regional Emergency Dispatch Authority, U.S. Border Patrol, Bureau of Indian Affairs, New Mexico Department of Health, Changing Lives Coalition, Artesia High School, New Mexico Department of Game and Fish, Eddy County Emergency Management, Artesia General Hospital, HollyFrontier, PVT, CVE, Eddy County DWI Program, Light Tower Rentals, the Chase Foundation, Santo Petroleum, Concho Resources, and Wal-Mart. The free event will also include free food and drinks, as well as entertainment by G-Money and C-Boticz, a doughnut-eating contest, a mascot dance-off, Zumba, car seat inspections, drug take-back, and face painting. “Whether it is APD, AFD, the New Mexico Department of Health, or a private entity such as Central Valley Electric Cooperative, each and every one of the individuals and entities participating has an important message for an important group… the kids of the community,” said Smith. “We sincerely hope that they take something away from the event and have fun, too.